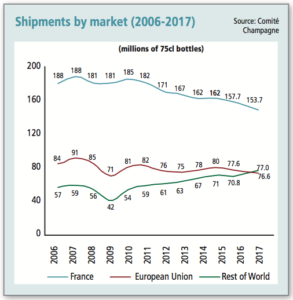 Estimated figures for total shipments during 2018 show that more Champagne was consumed in foreign markets than France for the first time in over 50 years. The two presidents of the Comité Champagne, Maxime Toubart and Jean-Marie Barillère announced last week that declining shipments in mature European markets – especially France – and growth in countries such as Australia, US and Japan, had affected the balance of global Champagne consumption. “Exports have overtaken France for the first time,” he said, before adding, “Well, since the early part of last century – when Champagne was mostly exported, and not consumed very widely in France,” he stated. Domestic sales for Champagne have also been on an almost steady decline since a peak in 2007, when France consumed as much as 188m bottles of the fizz, compared to 150m by the rest of the world. Driving the growth in exports for Champagne have been markets outside Europe, in particular, the US, Japan and Australia, although increasing sales in a range of smaller emerging markets have also contributed. Looking ahead, Barillère expects the spread of Champagne consumption to become even more evenly split between the major areas of the world. “If this trend continues, then in 10-20 year’s Champagne will be one-third France, one-third Europe, and one-third the rest of the world, or it could be higher], depending on where there is wealth development,” he added. “The French market is decreasing, and so Champagne houses have invested a lot of money in new countries,” he commented. The French market for Champagne has been declining for two main reasons. Firstly, the sales of grower Champagnes direct to consumers in France has diminished, and secondly, the number of promotions on entry-level Champagnes in French supermarkets have fallen, in line with a reputed fatigue among domestic consumers for the retail technique. As a result, Barillère said that turnover for Champagne in 2018 was “stable”, and may even have increased to a level slightly above last year, which was a new record for Champagne.